Ambassador Amina Mohamed is an accomplished diplomat and distinguished negotiator, Ambassador Amina has a wealth of experience spanning over 28 years of public service in Kenya and at the international level. She has over the years earned a reputation as distinguished diplomat, lawyer, manager and policymaker working across a broad spectrum of issues facing the global community from International Trade and disarmament issues to the exciting field of sustainable development and environmental policy. She is a committed International civil servant who has had a distinguished career both in Kenya and internationally. 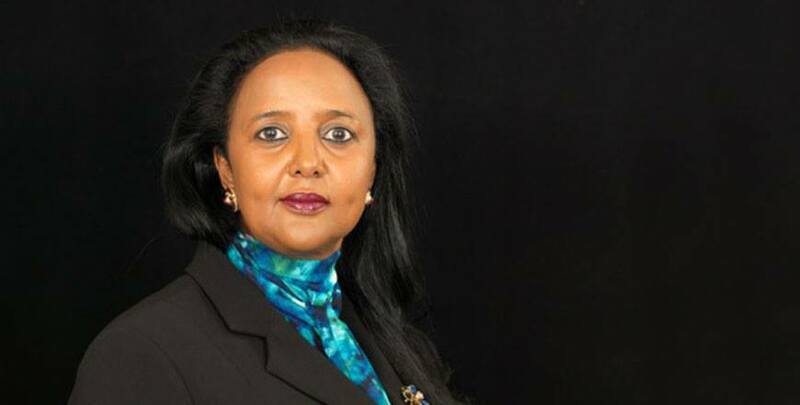 She has risen through the ranks in Kenya’s diplomatic service to the now top diplomat as a Cabinet Secretary. Ambassador Amina served as Kenya’s Ambassador/Permanent Representative to the UN in Geneva between 2000-2006, during which time she registered many achievements. For instance she was the first woman to chair the General Council of the World Trade Organization as well as the first African and first woman to Chair the Council for the International Organization for Migration. She undoubtedly brought to her position as ambassador some excellent analytical and interpersonal skills which she developed during the course of her career in the multilateral arena. Her admirable negotiation skills served her well and she effectively articulated global issues pertaining to the WTO. Above all, she was a tireless team player which was evident during lengthy drafting sessions and while dealing with sensitive International Agreements. Upon the expiry of her tenure abroad in 2006, Ambassador Amina served the government of Kenya as Director for Europe and the Commonwealth Division as well as Director for Diaspora Affairs in the Foreign Ministry. In 2008, she again distinguished herself as Kenya’s Permanent Secretary and Chief Executive Officer in the Ministry of Justice, National Cohesion and Constitutional Affairs. During her tenure as Permanent Secretary, she played a critical role through exceptional leadership to fast-track important political, legal and constitutional reforms. Ambassador Amina is an excellent strategist and visionary. She anticipates the management needs of every organization in which she works. 2013 to date: Cabinet Secretary Ministry of Foreign Affairs and International Trade. 2011-2013: United Nation’s Assistant Secretary General and Deputy Executive Director, UNEP. 2008-2011: Kenya’s Permanent Secretary in the Ministry of Justice, National Cohesion and Constitutional Affairs. 2010-2011: President of the United Nations Conference on Transnational Crime, Vienna. 2006-2007: Director for Europe and Commonwealth Affairs as well as Director for Diaspora Affairs Chairman of the Task Force Sub-Committee on Strengthening and restructuring of the Department of Foreign Trade and Economic Affairs. 2000-2006: Ambassador/Permanent Representative of Kenya to the United Nations and other International Organizations based in Geneva. Chairman, Coordinator and Spokesperson for the African Group in the WTO, Human Right Commission. President of the Conference on Disarmament in 2002 Chairperson for the International Organization for Migration in 2002 Chairperson for the Trade Policy Review body in 2003 Chairperson for the Dispute Settlement Body in 2004 Chairperson for the General Council of the WTO in 2005. 2001–2005: Member of the Executive Boards and Committees of the WHO, UNHCR, WIPO, ILO, UNCTAD and UNAIDS. 1990-2000: Kenya’s Legal Advisor in various Missions abroad, including the 6th Committee of the United Nations.